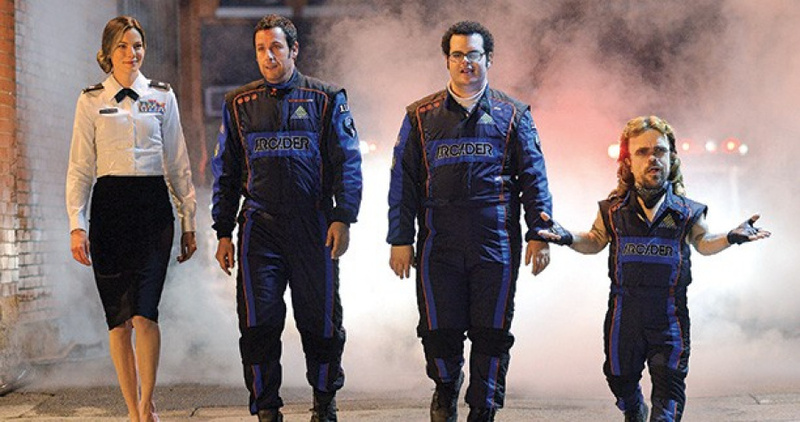 Remember Pixels? It was a short film made by Patrick Jean back in 2010, and showed New York city being invaded by characters from famous retro games. The short is being turned into a fully-fledged movie helmed by Home Alone and Harry Potter director Chris Columbus and starring Peter Dinklage (Game of Thrones), Adam Sandler (Funny People), Kevin James, (Mall Cop), Michelle Monaghan (True Detective), Josh Gad (Frozen) and Brian Cox (Braveheart). The plot of the film involves aliens mistaking video game footage as an act of aggression, which results in them sending similar characters to wage war on earth. To combat this strange threat, a group of expert arcade players is called upon. To make the film a reality, studio Sony Pictures has inked licensing deals to cover the use of video gaming properties such as Donkey Kong, Space Invaders, Pac-Man, Galaga, Asteroids, Q*Bert, Missile Command, Defender, Breakout, Robotron and Centipede. There would be no way to make the movie without these legendary characters – they are as important to the film as the roles that Adam, Kevin, Michelle, Peter, Josh, and Brian are playing. It was a real thrill to see everything come together exactly as we envisioned it, and we’re grateful to have all of these fantastic companies on board. There's no footage at present, so instead have a gander at the original short film and imagine it with a massive Hollywood budget and an actual plot. I'm looking forward to the first trailer so I will know if it's going to be a crap or not. I don't get the hate on Sandler. Sure he made a lot of horrible movies lately but Chris Columbus is directing this one. And Sandler isn't a bad actor at all (Punch Drunk Love, Reign Over Me). This was the exact same plot of a Futurama episode, Anthology of Interest. What a rip-off! @outburst Don't forget Click and 50 First Dates too or Bedtime Stories. I like him as an actor too. Might be getting the Eddie Murphy treatment. Wow I couldn't have imagined how long that short took to film but did they have the license for these characters originally or did they do this with no one's consent? Yeah I guess. I enjoyed The Wedding Singer, Anger Management and Water Boy too along with what you listed. Although it's a shame I haven't watched Happy Gilmore yet. They say it's one of his best. But I couldn't find it on video store. I may try Amazon and buy it instead. Anything that has Adam Sandler attached to it today pretty much isn't a good thing. Yes he can actually act (I loved Punch Drunk Love), but his films lately have been beyond terrible (and let's not even mention other Happy Madison films he hasn't been in). The only thing that gives me hope for this movie is the fact that it has Peter Dinklage in it. Wow. The hate is strong with this one. On one hand we have peter dinklage who is an amazing actor. On the other we have adam sandler who made 8 crazy nights. Yeah, just the involvement of Sandler makes me wary of this. He hasn't made a movie I liked in ten years or so. I think he can be good, though. And I love Michelle Monaghan and Peter Dinklage. Who knows. It's a interesting premise. I don't get all the hate either. Admittedly, Adam Sandler's movies are somewhat of an acquired taste, but he has made some funny movies and like some have already said, he CAN actually act, although it isn't always evident in the kind of movies he is usually in. The latest movie with Drew Barrymore isn't supposed to be that awful either, from what I've heard from people. Interesting and well made short, haven't seen it before. Could be interesting but one has to wonder what kind of a plot you could attach to it. Classic (8 bit and older) video games exacting revenge on humankind because of us abandoning them for newer and shinier HD ones? I can't wait to ignore this and watch the RedLetterMedia review instead. Where did you hear that Sandler bailed out of Grandmas boy due to video games? I didn't know he actually hated them. @Oaf7724 i agree, things like this wont happen on Yivo! Well what little hope I had for this went out the window when I saw Adam Sandler was in it. I shall pass on this. I doubt that Nintendo will let Sony make their IPs look bad (or at least intentionally). Whenever Nintendo licenses another company with one of their IPs, they always kept a close eye on what they are doing with it. Whatever is in the final product is what Nintendo approved/were fine with. Nintendo is very protective of their IPs. Heck, Nintendo even told Disney how Bowser is suppose to hold his teacup in Wreck-It Ralph during production they are that protective. None of you should be worried about the depiction of Nintendo's IPs in this movie. Though how good this movie is going to be since Adam Sandler is in it... I'm not sure. Lets wait and see. I've only ever really enjoyed one Adam Sandler movie, Little Nicky... and that was mostly because of the script. I'll have to take people's word that he can actually act. As for whether this movie can be good - of course it can. Every movie has the potential to be awesome & no director goes out to make a bad movie. Problem comes in the execution. Sandler can be a great actor when the movie calls for it, but his recent films have given a big reason to doubt the quality of Pixels. The fact that it also has (woosh) Kevin James makes it worse for many more people. I'm unsure if Peter Dinklage being on the cast would help matters because this is an Adam Sandler movie, I would expect a flood of 'midget' jokes. Regardless of how it plays out, this film will look outstanding. Trust me on that one. Also, there will be some fun supporting actor of actual talent as well. Hopefully Kevin James's role isn't too distracting and lame this time. @Oaf7724 Just what I was thinking. Y'know, the short is cool, but the premise for the feature sounds utterly ridiculous, and not in a good way. Spoiler alert, those aren't pixels. Those are vowels. I fail to see how that short could translate to a feature film and attaching Sandler is a death sentence. As far as im concerned he is only good for a handful of rom coms.